Recently, in an iBooks Author post, I noted “I look forward to the day when a student asks a teacher if it’s OK to turn in that project as an iBook.” Not long after, I received a comment from Jon Smith, a 5th grade teacher at Gibbs Elementary School in Canton, Ohio. He noted “I have used iBooks author with my special education students. We were able to publish the book in the iBooks store a few weeks back.” Download the free iBook here. After you download a “The Two Kids and The Desert Town,” send along your comments via iTunes or Jon’s Twitter account. The students will love to hear from you. I wrote back to Jon and asked him for more information that I might share as a guest post with my readers. 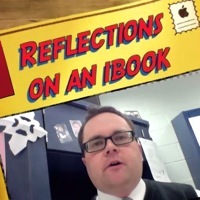 I’m pleased to see that he packaged his student reflection as an iMovie for all to see. We need to globalize our teaching. Kids need to understand that there are other people in this world who care about their work than just their teachers. Special Ed kids are much more capable than people give them credit for and I wanted to show that to people including the kids. … We wanted to squash stereotypes about special education students and showcase their successful work. … Our kids are really touched by the fact that nearly 400 of their iBooks have been downloaded by people from all over the world .. and they’ve received great comments on their work via Twitter. The Two Kids and the Desert Town is the heroic tale of Marvin and Ashley, a brother and sister who responded to a digital distress call for help. Bravely they set off to Desert Town to use their language skills to rescue the residents from a variety of linguistic perils. Among their accomplishments – they settled a long running conflict at the intersection of Antonym Avenue and Synonym Street. At the Simile Cafe they lectured customers on the power of positive similes. Before leaving town they even manage to instruct the mayor and assembled town hall meeting on how to properly use abbreviations. Triumphantly they return home to big hugs from their anxious parents. The book is fully illustrated with hand drawn images, photographs and engaging video clips. I look forward to the sequel. Thank you so much for the wonderful post. My students and I appreciate it. This is indeed a wonderful and inspirational post. Thank you so much for sharing it. Those iBooks look like a really good idea, I hope more educators will use it as a teaching medium.